Airflow is key. Banks' Monster Exhaust system eliminates the factory restrictions and really takes Golf diesel performance to a whole new level. More quickness off the line, more power throughout the RPM range, less heat, and better fuel economy ... all in one simple bolt-on package. Airflow is key. Banks Monster Exhaust system eliminates the factory restrictions and really takes Golf diesel performance to a whole new level. More quickness off the line, more power throughout the RPM range, less heat, and better fuel economy - all in one simple bolt-on package. Banks Power's diesel product line is just for pickup trucks, right? Not anymore. Our approach to diesel performance is 100 percent applicable to just about any diesel application. If you're looking for power and mileage enhancement for your Volkswagen Golf TDI, the all new Banks 3 inch stainless steel Monster Exhaust system is just what the doctor ordered. Featuring Banks signature quality, construction, and perfect direct-replacement fitment, Monster Exhaust is an extremely simple and economical way to kick up your Golf diesel. Your factory exhaust system does you no favors. It's too small, too restrictive, and leaves way too much potential performance on the table. Not to mention fuel economy. 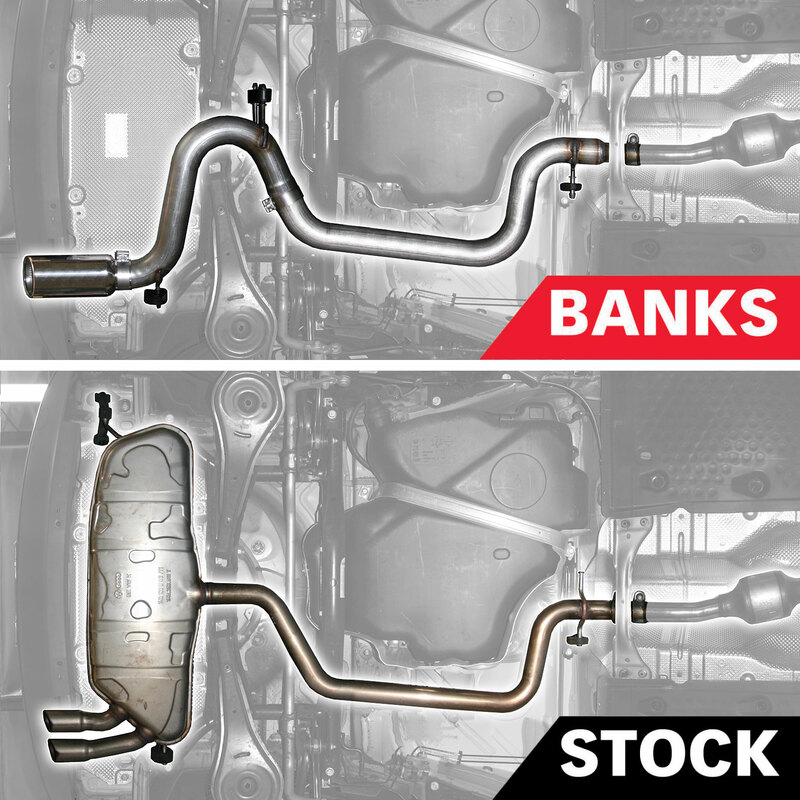 The Banks Monster exhaust system delivers what you deserve - a free breathing, restriction-free, system that makes your Golf quicker, more powerful, more fuel-efficient, and lots more fun to drive! Monster Exhaust comes complete with all necessary mounting hardware, easy-to-follow instructions, and includes a distinctive 4.5 X 5.5 inch ob-round tip in your choice of polished chrome-over stainless or high-temp black! And to help keep it looking good, there's a 1/2 inch air gap to keep heat from tarnishing the finish. An adjustable clamp lets you position it on the tailpipe just right.